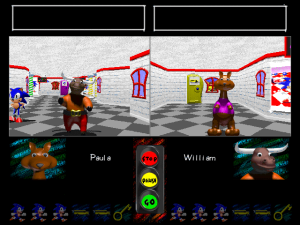 Why the hell did they decide to make Sonic the Hedgehog the star of an educational game for children? Who allowed this to happen? We want names. Who, somewhere in the leadership of Sega, let this happen? Who? In the mid-1990s, Sonic the Hedgehog was one of the hottest video game characters out there. 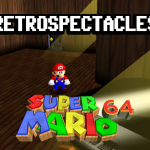 His too-cool attitude and the blisteringly fast gameplay of his games made him the slick alternative to the stuffy Mario. And with how popular he was, this meant there was a bounty of Sonic the Hedgehog branded everything: Sonic the Hedgehog toys, Sonic the Hedgehog comics, Sonic the Hedgehog cartoons, Sonic the Hedgehog canned pasta… The list goes on. It only makes sense that Sega would want a Sonic the Hedgehog game for elementary schoolers, right? In comes Sonic’s Schoolhouse, a tale of bad branding decisions and corporate failure. 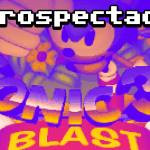 The year of 1995 happened to be smack-dab in the middle of a lull of new Sonic-related content. With the release of Sonic 3 and Sonic & Knuckles the year before and the Sega Saturn looming ominously on the horizon, there wasn’t really any hopes of a new main-series Sonic game for a while. Sonic X-treme, produced by the American Sega Technical Institute, was going to be the hot new Sonic game for the Sega Saturn; at least, that was the plan. 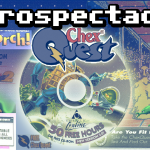 A combination of poor project management, overworked programmers, horrific miscommunication, and a too-tight deadline were all responsible for the fact that X-treme was already doomed before it had even gotten off the ground. This time period was full of a lot of awkward missteps for the Sonic franchise: with barely any time to make a hit new Sonic title, the gap was filled with a lot of spinoffs. Some of these were generally well-received – Knuckles’ Chaotix for the Sega 32X, for example, was generally well-regarded as a good game produced for a bad and unnecessary system. They couldn’t all be winners, of course. Sonic 3D Blast was a hodge-podge of bad design choices that made a Sonic game feel slow and puzzling; Sonic Labyrinth, even more so. Nearly all of those games, however, would make it onto compilations like Sonic Gems Collection. 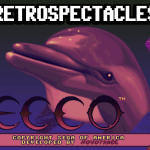 Some were fondly-remembered treasures, and some were just laughably awkward, but they all held a place in the palpitating hearts of Sega fans. And then there was Sonic’s Schoolhouse. When you think of Sonic the Hedgehog, there’s a lot of thoughts that could spring to mind. Maybe you think of Sonic as a character, and all the fast and freaky fun that he embodies. Or the Sonic the Hedgehog 1991 video game for the Sega Genesis, which was kind of clumsy with its lack of basic gameplay mechanics that would later go on to define the series, but a revolutionary game at the time. Or even, if you’re new to the series or particularly embittered by time, you think of the Sonic the Hedgehog 2006 video game for the Xbox 360 and PS3, a half-baked monstrosity of plot tumors and game-breaking glitches. Certainly, though, you don’t think of Sonic kidnapping you and forcing you to go to his school. Booting up the game dumps you off in a title screen that has no clear labelling, making going through the individual options a chore (the manual doesn’t bother to make it any easier on you). Sonic greets you by taking up what feels like a good third of the screen. His voice is easily the most unfortunately memorable thing about the game, as he sounds like he inhaled a couple of balloons before talking to you. You can create your own profile, including selecting your own avatar that is ultimately meaningless unless you’re playing in split-screen (more on that later). Starting the game plays a disproportionately loud “YAHOO!” sound clip that could be heard by anyone within a 50-mile radius, and you are plunked immediately into a nightmare hell of grating midi music. The ‘nightmare hell’ part isn’t too much of an exaggeration, either: the game plays in the same faux-3D that Doom had popularized, with fixed-height walls and warping textures. In Sonic’s Schoolhouse, there’s only a few menial tasks that you are permitted to do: there’s the Math, Spelling, and Reading rooms, where Sonic forces you to learn; there’s Recess, which lets you choose one of two inane minigames to play; and there’s the Field Trip, where you can… watch videos about animals. Boy, life was wild before YouTube became the norm. I haven’t seen my family in 10 days. The Math Room is flooded with what the manual refers to as a “herd of dancing numerals”. It’s simple and innocent enough, but kind of weird: you click on one of the numbers (which are all as large as you are, and they all have morose-looking eyes), then you click on a matching blackboard. The number disappears, and Sonic rewards you by opening a previously-locked door, where you will repeat this task again until rewarded with a trip to Recess. The mathematical problems are appropriately levelled for each age group, with kindergartners filling in the missing number from a counting sequence while fourth graders work out basic addition and subtraction. The Spelling Room is fairly similar to the Math Room at first glance. A “gaggle of dancing letters” awaits you, eager to be warped out of existence. Unlike the Math Room, however, it involves a lot more guesswork than should be required of a child, with no clear reward for getting the right or wrong letter. While the kindergartners simply fill in a passage from the alphabet (easy enough), fourth graders are expected to piece together incomplete words with no hints or context for what word they could be spelling. One example is the puzzle WO___, which could be either “woman”, “world”, or “words”. There is no way of telling what the word will be, except for guessing random letters until an observable pattern emerges. The Reading Room is overwhelmingly obtuse for children within its age range. Lengthy words include “physician” and “convertible”, and are accompanied by low-resolution images that wouldn’t necessarily make clear sense to a child. 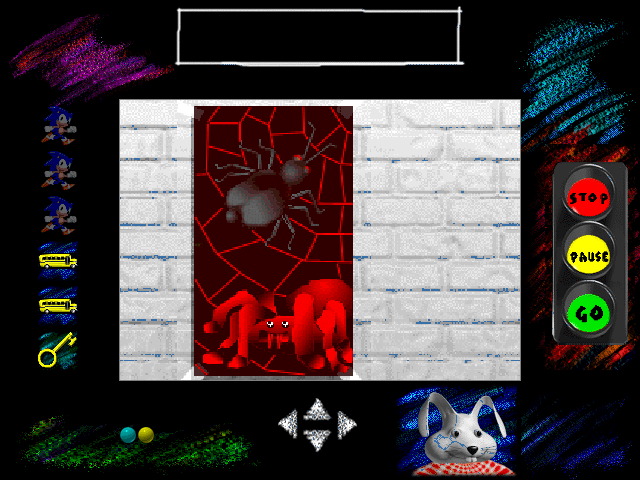 Of one of the worst offenders was “Halloween”, associated with a scary pumpkin – when the youngest end of the player base has only spent a few years with the ability to form solid memories, it feels like a non-sequitur to expect them to be able to form the connection between a holiday they’ve only experienced a few times and its imagery. Sonic! What have you done to your friends? Sonic, why won’t you answer me? Am I going to become a statue too? Recess is a mild relief compared to the repetitive nature of the learning rooms, but not by much. The two games are pretty simple. 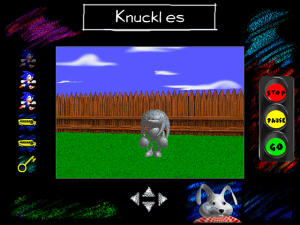 One is a Concentration clone involving matching statues of various Sonic characters, while the other involves collecting a number of golden rings while Dr. Robotnik’s minions chase you. Neither of these games are very fun, and quickly become just as tedious as the educational ones. As already mentioned, the Field Trip section is utterly boring – which is odd, because every piece of promotional material seems desperate to promote it as the most redeeming part of this game. Though low-resolution FMVs with poor voice acting might have been thrilling back then, it completely crumbles under the test of time. Possibly the worst aspect of this section is that it’s not even accessible from the start. To get in, you must find a bus pass in one of the Learning Rooms. This builds up unrealistic hype and leads only to crushing disappointment. 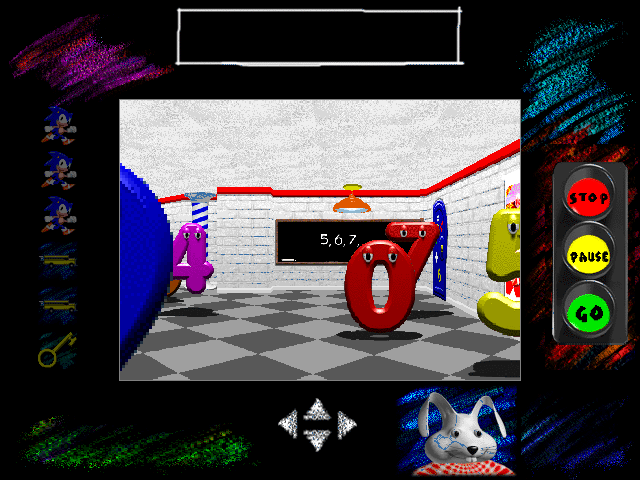 The printout gumball machine (accessible via the title screen, having no real effect on gameplay) is the evident final goal of your trip to Sonic’s Schoolhouse – enough so that it was one of the first things they developed for the game. Every time you answer a question within the game correctly, a gumball is added to a gumball machine in the main menu. Once you reach 100 gumballs, you’re awarded the ultimate prize in the game: A printout certificate for you to color! You’ve earned it, kid. Fight to the death with your mortal foe Solve math puzzles with a friend for your dark lord Sonic’s amusement! For some ungodly reason, they decided at some point in development that what this game really needed was a two-player mode. As if things weren’t bad enough here, you can ask Sonic to kidnap a second victim. Well, the gameplay is literally exactly the same, actually. It keeps a tally of who’s doing better at individual games, which seems like a great way to ruin friendships and build general distrust, but other than that, nothing substantial changes. One of the more cringeworthy and head-scratching decisions was the addition of Dr. Robotnik himself as an enemy within the Schoolhouse. He wanders around aimlessly while you solve puzzles, threatening to steal your collected answers if you bump into him. The most notable thing about Eggman’s appearance in Sonic’s Schoolhouse is that he is completely terrifying. 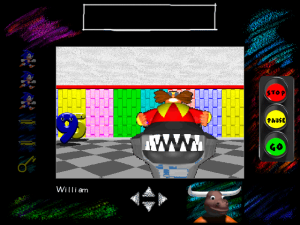 Like the rest of the characters, he’s a 3D model that has been processed into a 2D sprite. Unlike any other of Robotnik’s appearances, his Egg Mobile has a giant set of crunching teeth attached to the end of it. To a young child, this is overwhelmingly frightening. Having Dr. Robotnik chase you around in a crowded tiny room threatening to attack you with a giant pair of metal jaws is more than enough to overload a poor young child’s mind with fear. The atmosphere is oppressively claustrophobic and at times hostile-feeling, compounded by the general lack of explanation for your surroundings and the events occurring. There is no reason as to why Sonic has a Schoolhouse, or why you are participating in it. It might be a bit much to expect an explanation from a game intended for five year olds, but it’s confusing. There’s good reason for the Schoolhouse to feel so smothering, too: the game engine is lifted directly from one of their previous games, Bloodwings: Pumpkinhead’s Revenge. This would not be so atrocious if it weren’t for the fact that it was a horror game, done in the first-person faux-3D style of Doom that had been common for horror games at the time. There’s a sense of familiarity from the way that the game looks and feels, compounded by its graphical style. It’s really obvious, frankly, that it plays like a FPS horror game. Who are you? WHO ARE YOU?! We’ve established that Sonic’s presence feels completely arbitrary, and for good reason: Sonic wasn’t even intended to be in it. Cut material reveals that the original mascot might have been intended to be a talking clock with a completely different voice. These files are dated late 1995, a good year before the game was released. By May 1996, they had evidently obtained the rights to use Sega’s IP in their game. 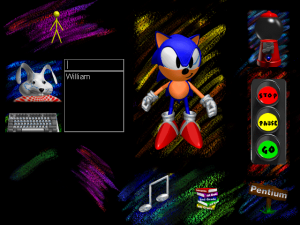 The sprites used for Sonic the Hedgehog himself came from the ill-fated Sonic X-treme, which had already been cancelled a month before the time of Sonic’s Schoolhouse‘s release. This doesn’t seem like that big of a deal, but it kind of puts a new skew on the inherent madness of the situation – this could have been its own original IP, but just wasn’t. With this realization in mind, the game starts to fall apart at the seams. Again, why does Sonic have a schoolhouse? It’s literally covered in aggressive Sonic branding, but in a distinctly insecure way: the walls of the schoolhouse have Sonic posters plastered on them. 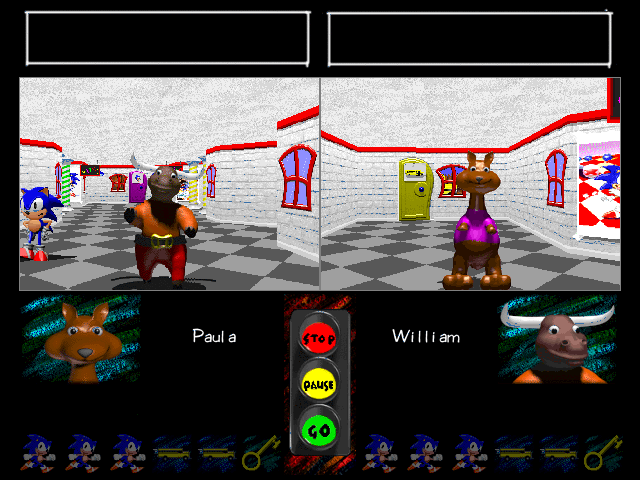 There’s an entire minigame for collecting rings, and another one for clicking on statues shaped like Sonic characters. After a point, Sonic himself seems mildly desperate to make sure that you believe that this is his game. The engine isn’t his, sure, and the building originally belonged to some other guy (they say that the body has never been found). But it’s his Schoolhouse, damn it! 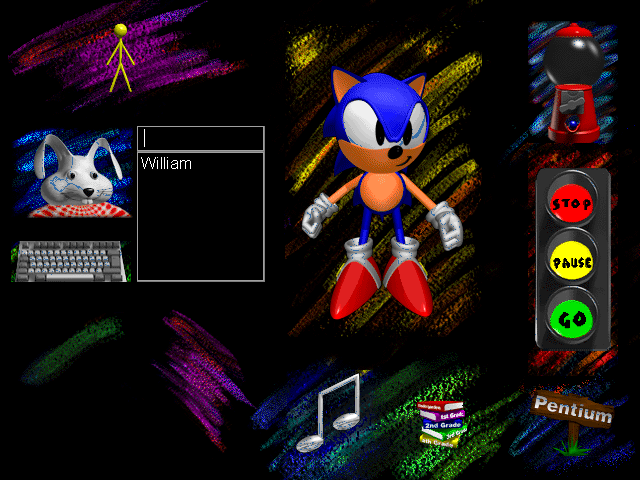 Even beyond the badly-drawn art and confusing decisions, Sonic’s Schoolhouse was really just an awful experience. The gameplay was identical in all segments, the voice acting was screechy and stilted, and it felt poorly designed all around. The educational content was lacking, the extra games were no fun, it was absolutely terrifying in parts… The list really just goes on and on and on. It’s not like this is just cranky groaning written from the perspective of an adult, either: the people that got an opportunity to play it hardly have fond memories of it. 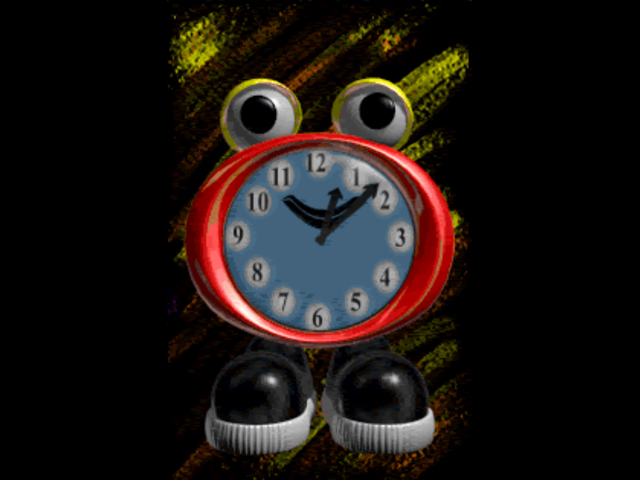 It slipped under the radar entirely for being completely forgettable, and if it had stuck with the clock mascot, God knows where it would be these days. But… Maybe we are being too harsh on it. It’s a kid’s game, right? Kids love this stuff! Right?